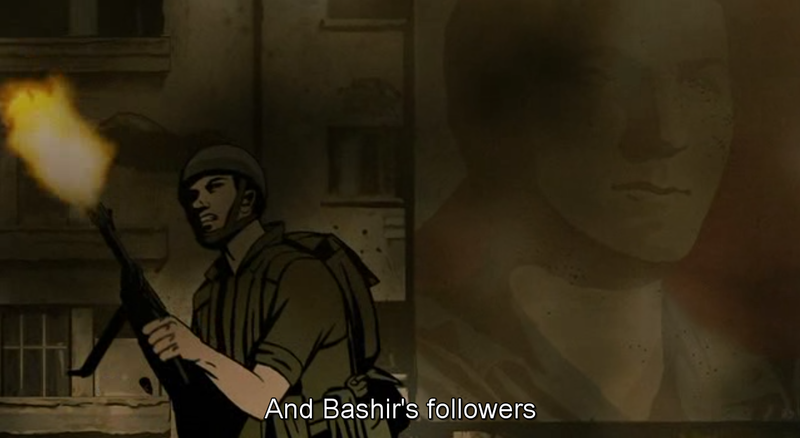 As the first ever feature-length animated documentary, Waltz with Bashir (2008) recounts director Ari Folman’s quest to uncover his memories of the role he played 20 years prior in the 1982 Lebanon War. Plagued by his inability to recall any of the events from the time he spent as an Israeli soldier, Folman enlists the help of his old military friends to discover the truth. During his journey, he faces many obstacles that take a toll on his mental state (primarily his memory). Aside from these narrative setbacks, the movie grapples with some greater problems that come in the form of binaries: between the real and the surreal, truth and fabrication, and guilt and innocence. 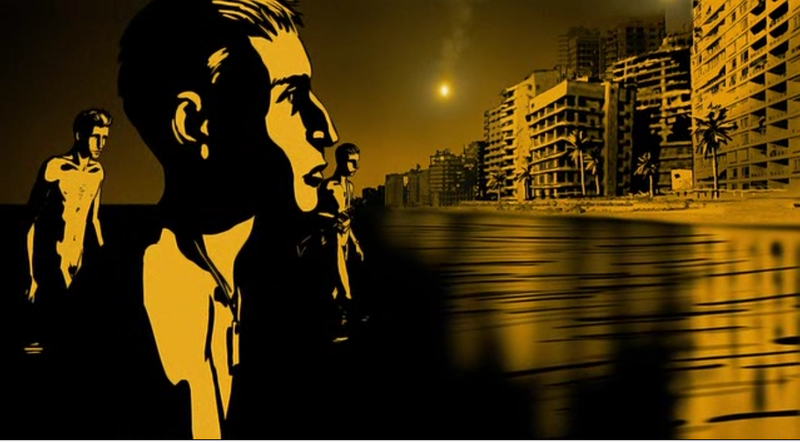 Throughout the film, Waltz with Bashir walks a fine line, dancing back and forth between these conflicting themes. However, the message ultimately becomes clear that the correct path lies in reality, truth and acceptance of one’s own guilt, and the film – in its creation, script, mise en scene, and overall artistic aesthetic – serves as an analogous representation that enhances this viewpoint. The three main binaries in this film are all interwoven, yet function in distinctive ways. 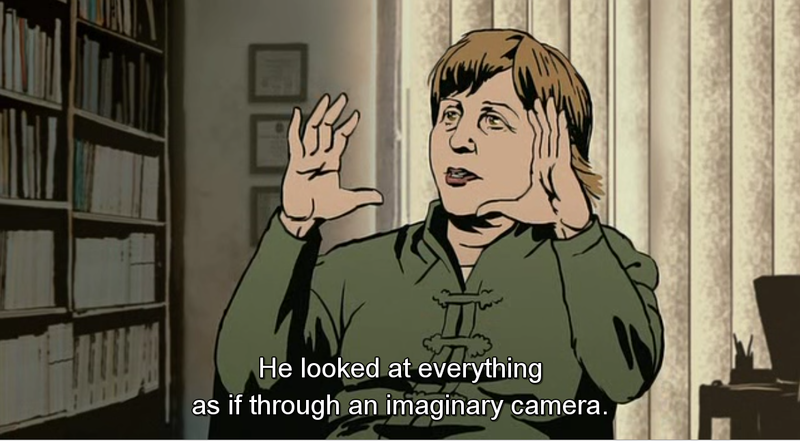 The real versus surreal binary contrasts the events that occurred in real life to the idealized version of reality displayed in the movie, since the latter manages to mask many of the horrors of war through its medium of animation. Instead of using more live footage or making a documentary composed solely of found materials, Folman makes the cinematic choice to romanticize events and blur the distinction between facts and imagination by creating a visual consistency for both reality and fantasy. These stills are manifestations of dreams and hallucinations, but they match other aspects of the film that are supposed to represent real events, in terms of visual style. The only noticeable difference is in color – whereas actual events are not restricted in hue, dream sequences, hallucinations, and other non-real instances are rendered monochromatic. This artistic decision thus creates the basis of the problem that the characters and viewers must face: of distinguishing between dream and reality and choosing which realm to live in. At first, it seems like Ari Folman picks the surreal, denying himself of the truth about his experience in the war; however, as the movie progresses and his fabricated memories are pieced together into something intelligible, he pulls himself out of the dream world and into a livable reality. The second binary, between truth and fabrication, helps solve the aforementioned problem. The fact that this movie is animated raises questions to its validity, giving it a different function from traditional documentaries, which would normally convince us of its veracity. The viewer’s inclination to not trust a form that is crafted by one’s hand urges us to assume that the content in this film should not be so easily believed. Even if it may be harsh or uncomfortable to confront, it seems like Folman is making a grander statement about the importance of searching for truth, since it is rarely as simple as we would like it to be. 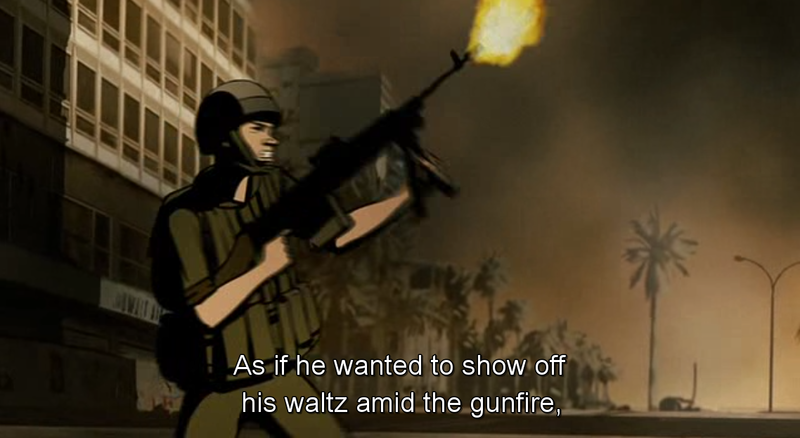 For example, these two stills depicting Frenkel in a waltz-like trance provide rich imagery and help readers make sense of the title of the movie, since the waltz is both literal and figurative. Primarily, it describes the actual “dance” performed by Frenkel, but it also refers to the tactful Israeli relationship with Lebanese president Bashir Gemayel during the war. 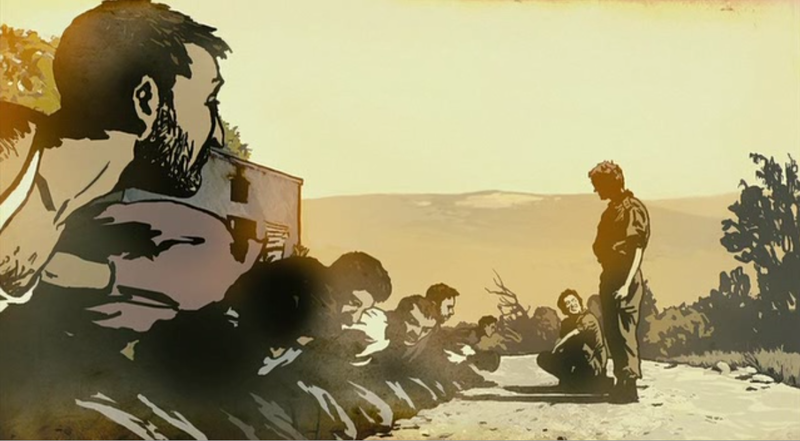 This latter interpretation is particularly evident in the second still frame where Frenkel is placed alongside Bashir because both take up half of the frame compositionally, further suggesting the double meaning of the word “waltz.” Even though this is a documentary based on real interviews and historical facts, the biased, artistic hand of the animator guides the viewer to see events in a rose-tinted lens. This effect is significant because the film pushes boundaries by challenging traditional notions and by playing with our expectations, making us realize that the truth is hardly ever obvious or clear-cut, but is rather shrouded by metaphors. Finally, the guilt and innocence binary exists in the script and narrative aspect of the film, as Folman tries to understand why he has blocked out his memories of war and brutality. The entire movie is a journey of Folman coming to terms with his actions from 20 years ago and attempting to find a way to live with what he has done. The text in this film is extremely powerful, and while some moments are didactic, others are just strikingly powerful and profound. This narrative serves to provide viewers with the message to accept responsibility for one’s guilt. Some of the most insightful scenes are those involving Folman’s therapist, who acts as a moral compass and philosopher for the human psyche. In saying that Folman “unwillingly took on the role of the Nazi,” the therapist implies that Folman suppressed his memories to distance himself from this feeling of shame and guilt. However, he argues that the deaths of the Palestinians, especially at Sabra and Shatila, were not Folman’s fault, and that Folman “only lit fires” because he didn’t know any better. 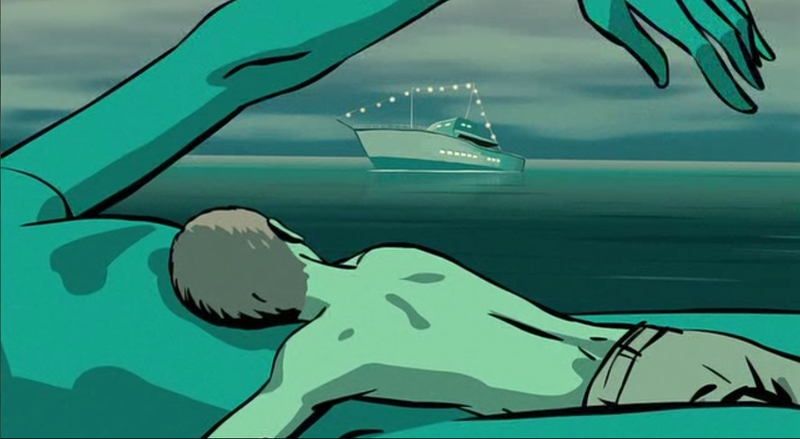 The subsequent still, which shows a constructed memory, uses edifying language to help Folman further deal with his past. 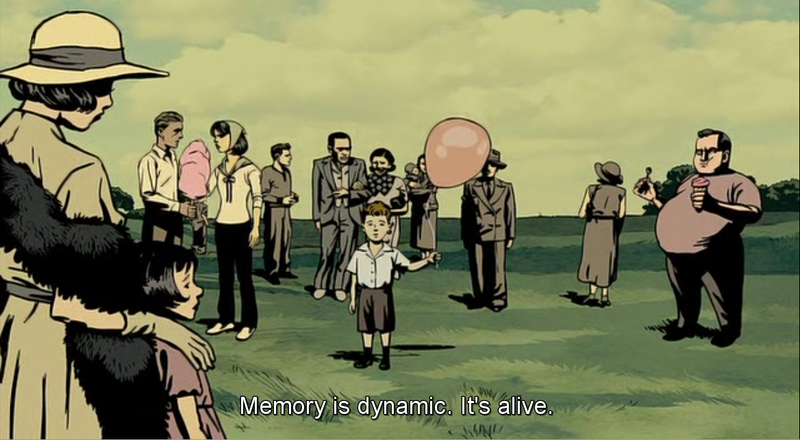 The therapist says here that “memory is dynamic. It’s alive.” The juxtaposition between the grown up Folman and the young child (who can also be viewed as the younger Folman who fought the war) draws a parallel between the innocent and guilty binary – the child as the innocent one who constructs memories based on what other people tell him, and the adult as the failed product of those lies. It is evident from these psychological teachings that it is important to remember one’s past, even if it is full of pain, because the alternative only leads to more problems and haunting questions that may never get answered. There is one particular moment in the film that captures all three binaries in a seamless way that is not only successful, but also takes advantage of film techniques to accomplish this task. In the specific scene from 41:55 to 43:55, Folman visits another therapist, Prof. Solomon, who tells him about an old patient of hers who had used a camera to document the atrocities of the war. However, when his camera broke, he fell apart mentally and emotionally as well because he had been using that camera as a mechanism for dissociation; sadly, “once pulled into the events, he could no longer deny reality.” The idea of the real vs. the surreal is emphasized here, as the shots change in color and lighting when transitioning from the therapist’s office to the montage of the photographs, which represent the romanticized and dreamlike nature of the war. While the real world is depicted in a very neutral and unsaturated color scheme, the photograph, in contrast, is highly saturated, with lighter white spots near the edges of the frame that make the image seem more like a hazy dream. The montage sequence from 42:31 to 42:49 is interesting because these photographs distort reality in a way that beautifies and idealizes true events. This collection of 8 shots each display a gold-coated version of the truth and show how living in denial under surrealist fantasies can actually cause more harm than good. Although it can serve as a quick fix to allow people to cope with their stress, it is not a long-term solution to one’s problems. These two shots are examples of some of the images in the montage, and they are considered beautiful, rather than gory because of the mise en scene. 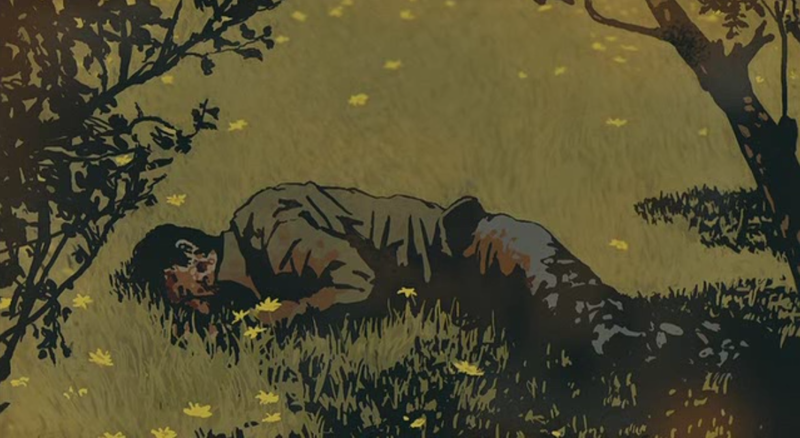 In the image of the dead soldier, vivid yellow flowers surround the corpse, somehow lightening the intensity of this photograph. The frame of the leaves and trees also provide an ornateness that beautify rather than traumatize. 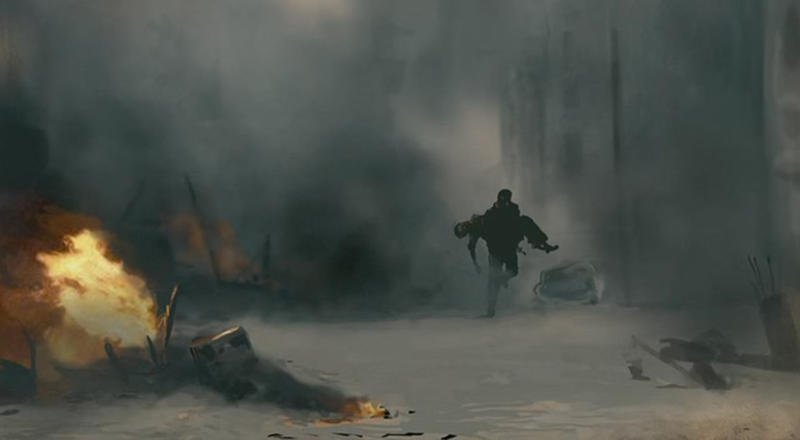 Meanwhile, in the second shot, the fire is dramatized and the soldier in the background looks like a hero, carrying a wounded mate out of the smoky haze. There is also a brightness, like a halo, just around the figure that makes his survival seem more hopeful. Both of these shots are perfect examples of how an art form can distort reality to seem less truthful, which is ironically what the film accomplishes by being an animation itself. These shots also create a stark contrast between the neutrality of the therapist’s office, which represents reality, and the colorful, dramatized nature of the photographs, which represent surrealism. The most intriguing part of this scene, however, is the last shot, from 43:48 to 43:55. 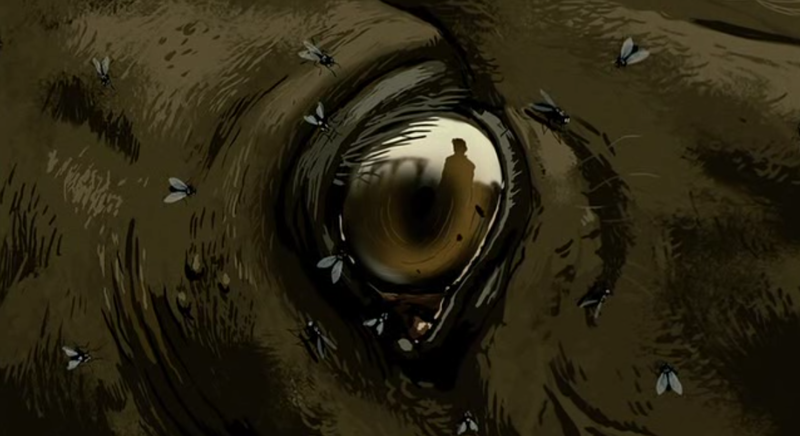 It is one of the most unforgettable and harrowing parts of the film, as we are given an extreme close up shot of a horse’s eye as it slowly dies. Even more interesting is the reflection of the man who passively watches this tragic death happen but does nothing to try to help. The flies surrounding the face and the wateriness of the eye make it seem like the horse is about to cry, personifying it and giving it humanlike qualities. We see an innocent animal suffer, while the perpetrators of such ghastly horror and tragedy stand idly by. The dichotomy between master and slave, guilt and innocence, powerful and weak are all present here, and in this hopeless shot, we cannot help but feel a social and moral responsibility to own up to our actions in order to prevent further innocents or civilians from dying in a battle that’s not even worth fighting. 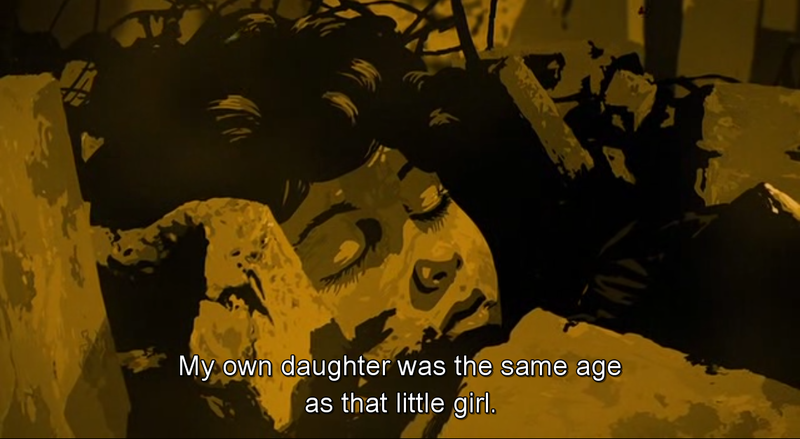 One of the last scenes in the entire movie depicts a similar shot, in which a young girl is found dead among the rubble in the aftermath of the Sabra and Shatila massacre. A familiar circle of flies swarm around her face, but in this particular shot, her eyes are closed, and we are given a full view of her head. The monochromatic orange, which was previously used to portray Folman’s “rising from the ocean” dream, is used here, and we as viewers are tempted to believe that this death is just a dream, too: it’s not real. However, the movie, once again, fools viewers of their expectations and shows that color cannot be expected to play one constant role. 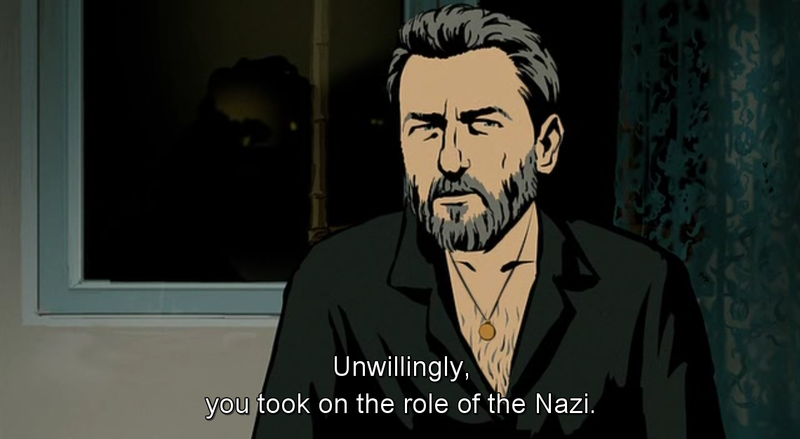 In conclusion, Waltz with Bashir is an extremely convoluted, amazingly constructed film that explores the complexity and the psychology of the human mind through three binaries, and demonstrates that very intricacy in the cinematic techniques and editing choices. In a short 90 minutes, the film makes the viewers feel the same sensation of yearning for truth that Ari Folman feels, which is what triggers him to make this documentary. Through this immersive and almost interactive journey, we learn, as Folman does, that people must face their demons, take responsibility for their actions, and live in the real world, for living in a dream doesn’t mean you won’t get any nightmares.